Kayak fishing has really taken off in the UK in a big way over recent years and it’s not hard to see why. Light, versatile and inexpensive, kayaks offer all the advantages of traditional boat ownership at a fraction of the cost and at far less effort, as anglers across the country have discovered to their delight. Easy to transport and simple to launch single-handedly, the kayak has opened up a whole new fishing experience to anyone adventurous enough to venture out in one, and brought previously inaccessible waters into reach. If you’re looking for a new twist to your angling, then a kayak might just be the thing. Modern fishing kayaks have come a long way from the skin-covered, wooden framed originals that the native peoples of the Arctic first developed for hunting seals and today there are many different kinds available. The sit-on-top – often abbreviated to SOT – has, for example, become very popular for sea fishing, while more traditional “sit-in” styles can be fitted with a huge number of accessories designed around catching fish. The kayak fishing market has become so large that there are now specialised versions made specifically for the angler – though they do inevitably tend to be more expensive. These boast a host of features, from flippers and foot driven propellers to enable you to keep both hands free for the business of fishing, to the latest range of “catamaran” twin-hulled kayaks that allow you to both paddle and fish standing up! Which kind appeals is largely a matter of personal choice and the size of your piggy bank, but there are two other factors that need a bit of consideration when making your choice – speed and stability. As a very general rule, longer thinner kayaks are faster and easier to paddle than shorter, broader ones, but less stable. Deciding which is the more important really depends on the type of fishing you do and the kind of water you intend to be fishing in. Where getting out to the fish quickly, or travelling a longish distance from shore is required, the advantage clearly lies with speedier and easier to propel craft. By contrast, if you’re planning on trying your luck at catching some fairly big fish, or in waters where the wake from other boats may be a problem, then stability wins out. As with most things in life, which one is best overall for you may end up being a bit of a compromise between the two. 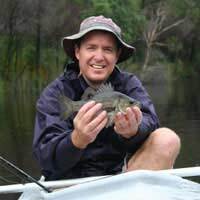 Despite being labelled as “unsinkable”, there are still some obvious potential dangers in setting out to sea or on a lake in a small canoe, so if you’re a novice, it’s worth considering enrolling in a training course if one is available locally, or pairing up with a more experienced fellow angler, at least until you feel confident about fishing alone. Arguably the single largest threat to kayak anglers comes from the wake of other boats, so it’s important to be aware of how your own vessel behaves when it hits choppy water, something which also affects sea-kayakers as a matter of course. No matter how good a swimmer you are, a life-jacket is an important piece of kit and don’t forget to tether your paddles – watching them disappearing in the current is a uniquely depressing experience and one that can have serious consequences. A kayak gives the angler huge freedom to fish in areas that are otherwise out of reach, particularly in large bodies of inland water or the around the coast, and the simple nature of the boat itself lends itself to just about any style of fishing. Some brave souls have taken to launching kayaks from larger boats some distance out at sea to experience the raw exhilaration of playing – and being towed along by – some of the world’s large game fish. While that kind of thing certainly isn’t going to be to everyone’s taste, it does go to show that there’s almost no limit to what you can do with rod and kayak.